ALIOTO-LAZIO FISH COMPANY Fresh Seafood Delivered Overnight! Time to Rise and Shine! 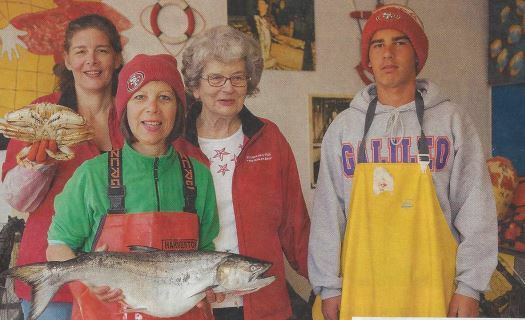 Alioto-Lazio is one of the last family-owned and operated fishing companies in San Francisco. Our company has a rich history that reflects the true flavor of Fisherman’s Wharf. Our Grandfather, Tom Lazio, demanded top quality, freshness and reliability for fresh fish. We continue our Grandfather’s legacy supplying fresh seafood to you and your. Make sure and pay us a visit when you are in the area! Second, Third, Fourth Generations pictured above! Fresh King Salmon and Dungeness Crabs being shown in photo. Fresh Dungeness Crab Now Shipping! Hours: M-F 6:00 a.m. to 2 p.m.